Sun, 2Oth: The weather forecast is sunny and 0 to +3°C. Join us for one day city walk and sightseeing of this very attractive town in Wallonie, Belgium. 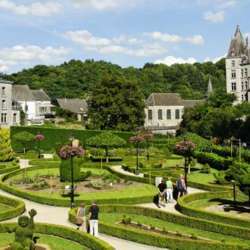 INTRO: "Durbuy is a town in eastern Belgium, known for its stone houses and cobbled streets. The clifftop Belvedere viewpoint overlooks the town and Ourthe River Valley. Nearby, Confiturerie Saint-Amour produces artisan jams. Clipped hedges depict animal and human figures at the Topiary Park. The half-timbered Halle au Blé was built as a corn exchange in the Protected content . La Ferme au Chêne brews beer using a 14th-century method." CARPOOL: I have 3 seats available in my car, please other drivers that are whiling to share seats to manifest proposals. Have you all a great week!